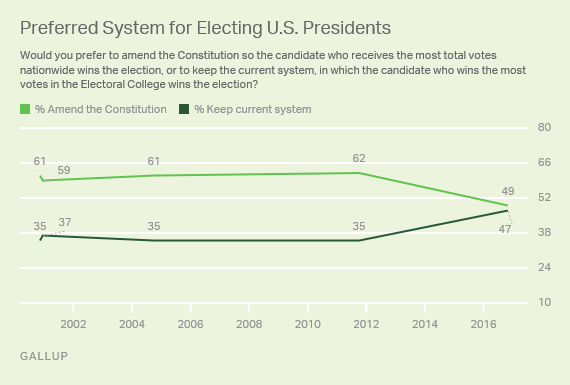 Americans' support for keeping the Electoral College system for electing presidents has increased sharply. Weeks after the 2016 election, 47% of Americans say they want to keep the Electoral College, while 49% say they want to amend the Constitution to allow for a popular vote for president. In the past, a clear majority favored amending the U.S. Constitution to replace the Electoral College with a popular vote system. I think it's pretty clear what's happened here, don't you? More Republicans have suddenly decided that the electoral college is awesome for some unknown reason. The Democrats did not. Now it's possible that if they ever win the EC and lose the popular vote by millions they too will be ready to embrace it. We don't know since that never happens. What we can see is that after 2000, which was the same situation as today essentially, there was no big uptick in support for the EC. There is now. And that's because the Republican Party is no longer even slightly interested in democratic norms. They are the "win at all costs" Party.